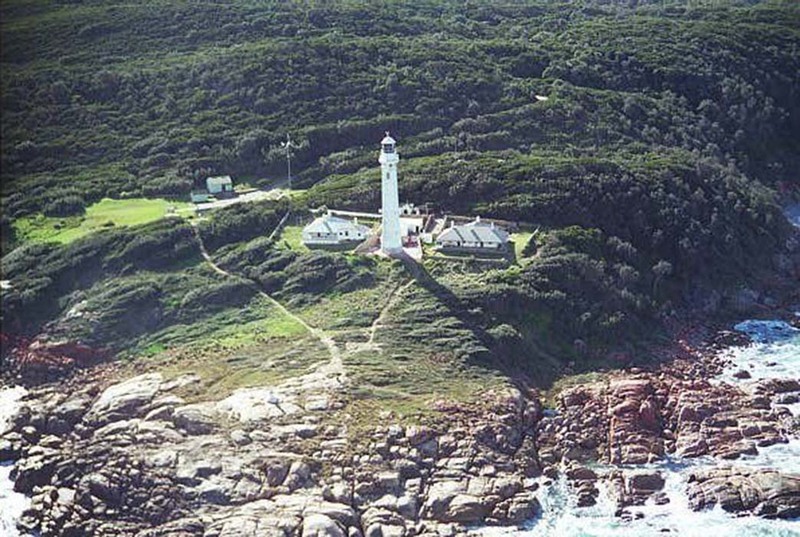 Point Hicks Lighthouse | Lighthouses of Australia Inc. Originally called Point Hicks, then later named Cape Everard, the former name was reinstated in 1970, ending a long running controversy over the name of Captain Cook’s first landfall in Australia. The Point Hicks Lighthouse was built in 1887-88, and was first lit in May 1890. In a break with tradition at the time, the tower was constructed of concrete. The two keepers quarters were built from timber. The kerosene lamp and clock mechanism were upgraded to electric operation with the connection of mains power in 1965. The light was more recently converted to solar power. The lighthouse is believed to be haunted by the ghost of former Lightkeeper Christofferson. A unusual feature of the light tower is its cast iron spiral staircase, which has162 steps cantilevered from the walls, rather than the traditional stone steps which are built around a central column. Originally access to Point Hicks was by sea. In 1920 a return trip, by land to Cann River, 47 kilometres away from the light station, took two days. By 1946 the journey had been reduced to 36 hours by a combination of horse and jeep. During the early 1950s it was still a 12-hour ordeal. Today, the journey is possible in 50 minutes but is still treated with respect. The light was known as Cape Everard from 1843 until 1970 when it was changed back to Point Hicks. It seem that there was some doubt to whether this was Cook’s first landfall in Australia, in 1770, because Cook had not taken account of crossing the International Date Line when recording his log. Therefore it was not challenged when the cape was latter named Everard. In the lead up to Cooks bi-centenary research was undertaken and the case was presented successfully to restore the rightful name. The area remains largely unchanged from the time it was first sighted back in 1770. The reserve is under a private lease and it is advisable to make your presence known to the lessee. Last information was the closest vehicular access was to a car park three kilometres away. The rest of the journey made on foot. The lighthouse grounds are open all year round.